ATHENS – Taxi drivers already trying to keep out Uber and ride-sharing services may scream again as cruise passengers arriving at Greek ports with hopes of another record-breaking summer will be able to hop a ride in Asian-style Tuk-Tuks. 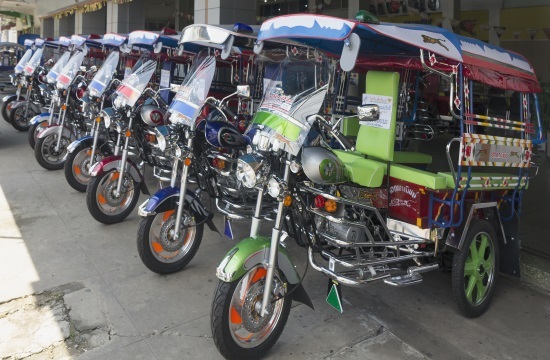 The three-wheeled modes of transportation, looking a lot like giant golf carts, are popular around Asia because they are everywhere and can weave it and out of heavy traffic, similar to that at Greek ports and Athens in the summer. Officials said they are also more environmentally-friendly than buses or taxis and will be shown off at this year’s Posidonia Sea Tourism Forum in May by first-time exhibitor Tuk Tuk Hellas, which will be providing demonstrations to the show’s delegates and visitors. Following a sharp three-year slump due to geopolitical tensions, some of the region’s key destinations, homeports and host countries are experiencing the first promising signs of recovery, the organizers said. “We have a record year for newbuilding deliveries, as the 24 cruise vessels that come on line in 2019 constitute the largest number ever in a single year. Collectively this will add a total of 42,488 new berths to the global capacity that need to be filled gainfully,” said Theodore Vokos, Managing Director of Posidonia Exhibitions.